Jeannette Travaline and Stacey Cocco of South Coastal Bank noted the steadily increasing numbers of women entrepreneurs in this area. They wanted their bank to be supportive and involved in this trend. They created a “Dynamic Divas” program, providing business women with education, networking, personal enrichment and professional development. Working with the brand new Dynamic Divas team, we designed a fun and innovative branding package, and an informational, attractive, user-friendly website. 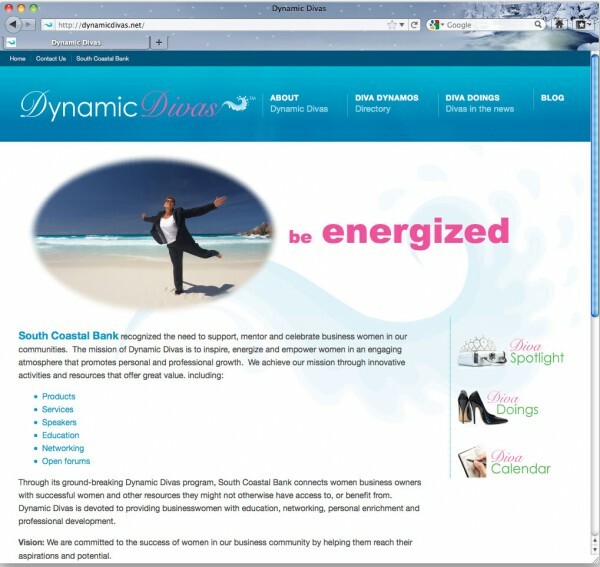 Since the program’s creation, hundreds of Dynamic Divas emerged. Feedback was fabulous and attendance continued to grow. Recently, South Coastal Bank brought the program under their jurisdiction, so the separate website was taken down and brought under the corporate website division.